Detached lyrical tatters adorn the errie booklet of the second album "Chamber Of Divine Elaboration" of the French REVERENCE. Asking I. Luciferia about the meaning of these lyrical impressions his answer is a little on the short side. "Lyrics are my personal visions and feelings which I can't explain." Fortunately, the vocalist, guitarist and sound creator of REVERENCE turns out to be a bit more talkative in other fields. REVERENCE have been existing since 1998 and release their debut album "Industrial Mental Concept", produced by a French underground label, in 2005 after several demos and split releases. One year later they sign a deal with Avantgarde Music and prepare the ground for the current longplayer "Chamber Of Divine Elaboration". The feedback so far is auspicious. "The album has been available for six weeks now. It's hard to get an overview but the reviews are very encouraging. We receive a lot of positive messages about this new album. But whatever the feedback, we have realized this album as we wanted it, and that is the principal thing." Besides I. Luciferia bass player Aym participates in REVERENCE, and in March 2007 drummer V.R. joins forces with them again which is one of the major differences compared to the debut album. "These albums are really very different. The concepts and ideas developed on "Industrial Mental Concept" are like an introspection and contain many feelings. "Chamber Of Divine Elaboration" is more experimental and visual, the hopeless urban chaos... Since the first opus REVERENCE take several ways but keep those already traveled for granted to escalate the intensity of the music which is the biggest important point." Another interesting aspect is I. Luciferia's approach to the music which breaks a deeply emotional symbiosis of depressive black metal and industrial/ambient to the listener. "I'm rather inspired by some movies and/or scenes or pictures than by a metal style, of course. REVERENCE is a metal band but it's not important. The sentiments you feel when listening to REVERENCE are of much more importance. Never mind the rest. We are like an ambient band where the atmosphere is progressive, each element is important and developed to the extreme. The main element and base is black metal but other elements are just as essential in the conception of our music." So it comes hardly as a surprise that I. Luciferia listens to many different music genres which all have a special significance and offer various emotions. "Dark ambient is a very particular style of music but many projects are so bad... My preferences are MZ412, Archon Satani, Aghast, Sophia and some others... A lot of classical music, too." 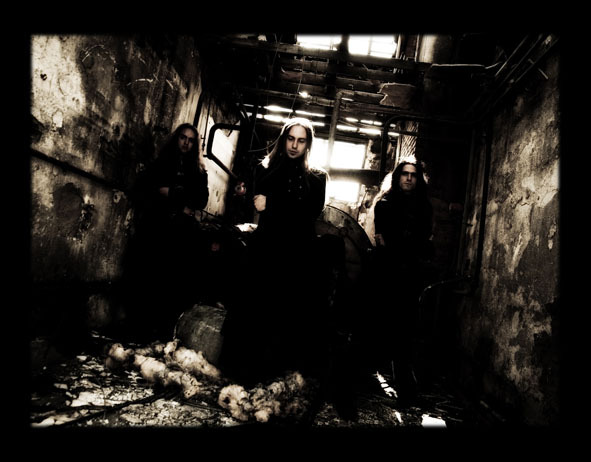 A very present characteristic in the music of REVERENCE are the dissonant melodies and choirs which often lead to comparisms with their fellow countrymen of Blut Aus Nord. "I know that many people appreciate us and BAN for the musical search and experiments but the results of the two bands are totally different. It's not the same atmosphere and work... I think these people know it very well but finally I'm not concerned about the comparisms that people do. With REVERENCE these dissonances all come naturally when a track is composed. They are an achievement which we see as a gain to be kept and developed to new sounds to reach a new level for each opus." These dissonances in conjunction with the lurid ambient sounds create a tangible cold, and this is perfectly intended. "Chamber Of Divine Elaboration" is the soundtrack for the modern world in decrepitude. There is a coldness unparalleled, oppressive and hopelessly eerie. Whereas REVERENCE is my personal soundtrack and vision of the actual world but each person reacts differently with his own feelings when confronted with a musical work or a general artistic way, and this function is also applicable to the daily life. I hope that listeners experience concrete visions and feelings via "Chamber Of Divine Elaboration" as if they were watching a movie in which they are actors with their own storyboards..."
The abandoned industrial buildings in the promo pictures amplify the chill and seem to be a perfect match. What is the allurement of such environments compared to the typical, more black metal like locations? "I know this location very well and time seems to have stopped there. Visually it fits very well to our music. REVERENCE are not trying to go for a black metal image or whatever... just what corresponds to us." A part of this oppressive cold may also be felt when REVERENCE make it to the stage one day and it's beyond question that there will be more to their performance than just entering stage, playing the songs and vanishing again. "We actually think about live performances but we play a particular style of music. As stated previously it's images before talking metal in the first place. So it's certain that we'll be using video projections and special lights for supporting the music impact. We aren't interested in anything less." Right now, they are already working on their third full length which will raise the musical progression to a new level and be released by Avantgarde Music again. "We've been believing in Avantgarde since the beginning. They always have good bands and a convincing work quality. Today we can say that we were right as they are doing a serious and good job. We really appreciate to work under these conditions." For further information check out the REVERENCE website or their myspace page. Interview done by Endrew. January 2008.